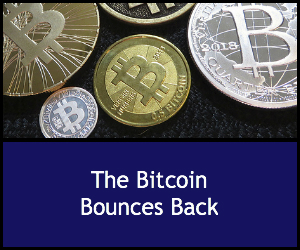 After a rough couple of years, the Bitcoin is surging back with a vengeance. Just a year after its fall from grace in the Silk Road drug site scandal, the digital currency’s market value has even beaten gold in the world’s markets. Whether hailed as a welcome alternative to government-controlled currencies or despised as a subversive tool for illegal activities, the Bitcoin is clearly a coin to be reckoned with. Since it hit the scene in 2008, Bitcoin has been widely embraced not just by the small group of cybernerds who spend endless hours running algorithms to digitally mine the coins, but by people of all kinds, especially in countries where governments and currencies are unstable and untrustworthy. Because it’s totally digital, Bitcoin isn’t produced or controlled by any central bank anywhere, making it a major step in the democratization of currency worldwide. Bitcoin transactions are virtually anonymous, and they can be used just bout anywhere two parties agree to use them. In the early years of Bitcoin’s existence it was viewed mainly as a medium for private transactions, more like barter than a fully functioning currency system. But after some high profile Bitcoin transactions involving in vitro fertility treatments, luxury cars and real estate, the coin made its way into global financial markets, where it traded at numbers ranging from a low of $20 to $1242 by late 2013, beating the price of gold at $1664 for the same period. Bitcoin was fast becoming a legitimate player on the financial scene, The US Department of Justice proclaimed that Bitcoin cold be considered a legitimate means of exchange, and Bitcoin exchanges such as Mt Gox sprang up to smooth the way between the Bitcoin and traditional currencies. The IRS pondered ways to tax assets in Bitcoin. But by 2013 the coin’s new higher profile had taken a major hit with its connection to illegal drug transactions, mainly on the booming online drug marketplace Silk Road. Silk Road was raided and shut down, its vast store of Bitoin confiscated by US authorities. The leading Bitcoin exchange Mt Gox also shut down, and heavy hitters in the traditional financial world began to strike back. In the early days of its existence, Bitcoin was largely ignored by the mainstream financial word, dismissed as nothing more than a digital curiosity. But after Bitcoin hit the world currency scene and became the darling of the “shadow net’ of illegal online activity, government and financial entities took steps to neutralize the perceived threat. US banking giant JP Morgan Chase published a patent for a “Bitocin killer,” an electronic alternative to Bitcoin that the bank could monitor and regulate. The Russian and Chinese governments declared Bitcoin illegal and transactions involving it void. Bitcoin was in quiet retreat, its value dropping and its exchanges closing down. But nearly a year after the closure of Silk Road and the collapse of Mt Gox and other leading Bitcoin exchanges, the granddaddy of digital currencies is rebounding. Prices are rising again as Bitcoin eases its way back into the mainstream financial world. Leading US newspaper The Chicago Sun Times announced in early 2014 that it would accept Bitcoin for its subscriptions and advertising. Online trading giant eBay added a “virtual currency” option to all its listings. Now, online colleges, led by Cyprus University, accept Bitcoin and Wells Fargo Bank is considering offering Bitcoin services too. By spring 2014, Bitcoin prices had jumped, rising by 64 percent in little more than a month to reestablish its place as a legitimate form of currency. Its success has inspired a number of imitators such as the Feathercoin and LItecoin. The Bank of Canada even experimented with its own version of a digital coin. And a number of private trading consortiums and clubs have adopted a form of digital currency for internal use. But none of these variants has had the staying power and profile of the original. Is Digital Currency Real Money?